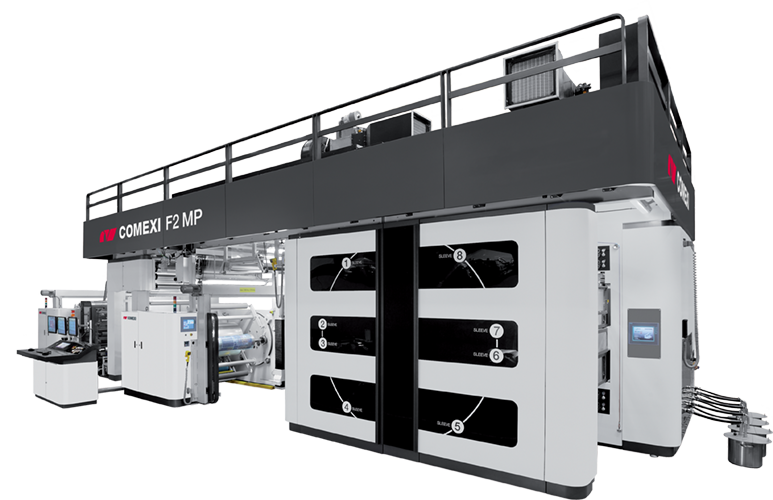 The Comexi F2 MP press has been designed to satisfy the print needs of the longest runs in the flexible packaging sector for the retail and wholesale channel. The Comexi F2 shares the patented FLEXOEfficiency concepts of ergonomics and accessibility, as well as the performance and robustness of the rest of the F2 range. All combined with a drying system design for the best drying performance and a reinforced design for the printing units at a maximum speed of up to 500 m/min for runs where the print speed is the differentiating factor. The design of the Comexi F2 MP printing unit is reinforced with respect to its siblings in the range, since it has larger diameter bearing supports, and large diameter bearings. It is fitted with a series of carbon fibre shafts both in the PC and in the AX. The PC ones are hydraulic for using hydraulic intermediate carbon fibre sleeves. The combination of these supports and shafts in carbon fibre offers greater robustness against the impacts inherent in flexographic printing, and makes it possible to obtain a high quality print at a greater speed. You will find several details that highlight this machine as the best solution in terms of maintenance: its easy handling and doctor blade access, filter change, greasing points, decentralised electronic panel, and others.